Seriously, this new kid on the block might just be on its way to revolutionise the healthy food delivery market in Malaysia. How could you miss this? We’ve tested close to 10 health food deliveries. We are still reviewing (but this takes time, so is anyone out there who wants to be a volunteer reviewer?). After reviewing quite a few health food deliveries, we’ve come to realise that there are many challenges along the way for customers (us!). All health food deliveries run their businesses differently. Some are subscription-based. This is good for those who are not always on the run. Some offer limited meals a week. Some are just way beyond our budgets. For some, I believe they might need more work on their menu. For most of them, we need to pre-order. What about those who instantly want something delicious, healthy, fresh and not too extreme (hint: #eatclean #eatraw) to savour? You know, sometimes we just wish that instead of dialling to Domino’s or McD, we could pick up the phone and order something that’s wholesome for us. Something that will do good to our precious bodies. Something that shows we are slowly making a lifestyle change. That’s what Epic Fit Meals Co. is all about. Equating freshness to greatness, they advocate using only fresh, natural ingredients that are free from preservatives or additives. In order to get the best out of your food, they use ingredients which are at their optimum quality and prepare Fit meals as and when you order. 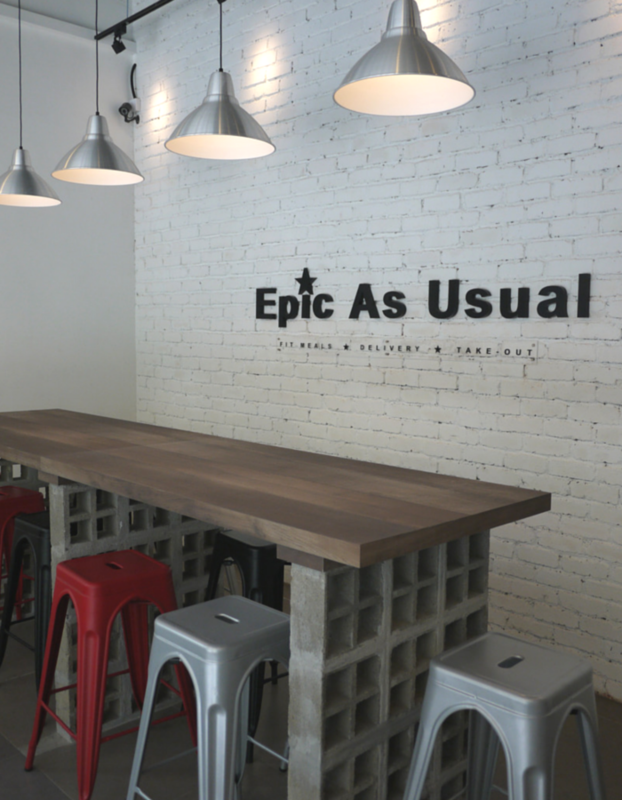 This means they are busy throughout the day in their Epic kitchen, from 11am – 11pm daily. Apart from being Malaysia’s first on-demand Melbourne inspired fit meals delivery (guaranteed 30 – 45 minutes free delivery), they also offer takeouts at their cool space at Damansara Perdana. We believe this long table gives you the opportunity to start a conversation with someone new. 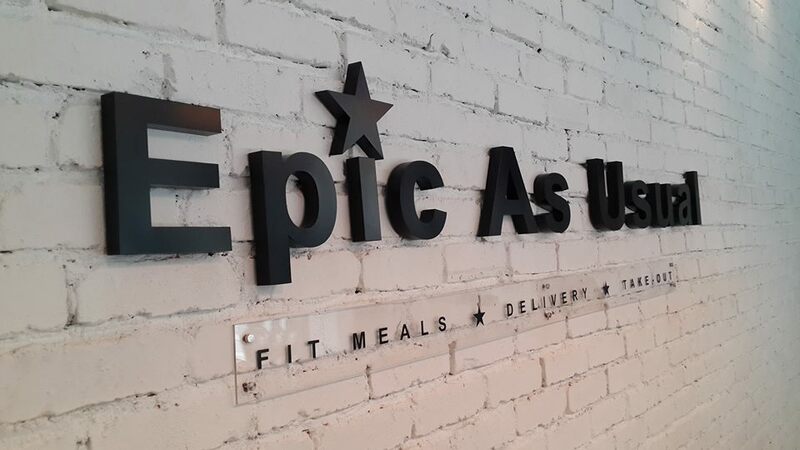 After months of rigorous experiments and tests with a qualified nutritionist, the guys behind Epic Fit Meals Co came up with a menu that boasts over 40 fit meals! From their Epic Sides to their Epic Baked “Fried” Chicken, each dish has something new to offer to Malaysian taste buds. What got us crazy was their little yet powerful Crunchy Chookies. We’ll get to that soon. 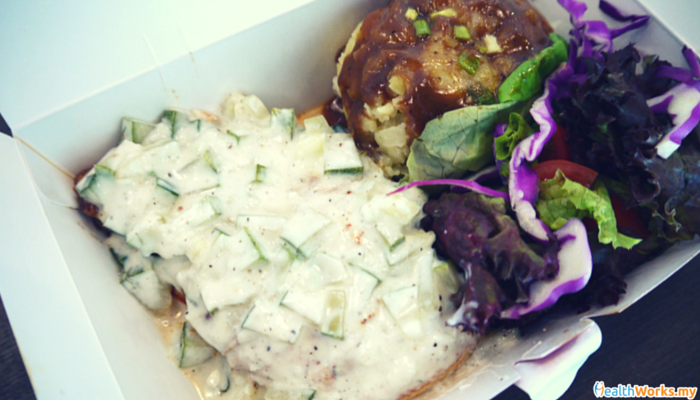 Wick Kee, Co-Founder of this growing on-demand fit meals delivery service invited us over to try out their meals. They guaranteed a 30 – 45 minutes free delivery within certain areas. I wasn’t convinced how they could pull it off. But, looking at how they strategised their kitchen and how process and data driven they are to plan for resources and get fit meals out, it’s not surprising that they are able to produce wholesome meals on the spot. Contrary to the other health food deliveries where you order just the main dish, this one lets you have a combo price for different sides options. You basically select your choice of chicken, choose a made-from-scratch sauce to pair, then choose your combination of sides or (they called it) Epic sides. Show me the food, HealthWorks. Okay. We tried one from each category. Read away and start drooling. Though, we have to admit we’re very bad with food photography (we’re improving). But below is basically what a normal human being will see. 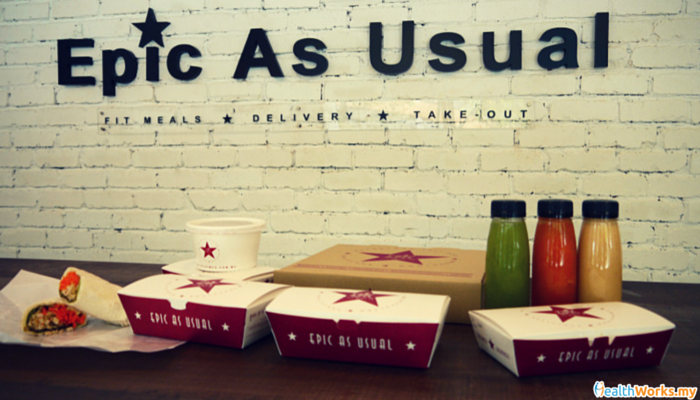 What’s in the box: Grilled chicken marinated with herbs, spices then flame-grilled to order. Mixed coral lettuce, tomatoes, shredded red cabbage, orange and almond flakes in Epic’s honey mustard dressing. Taste: Grilled chicken was juicy and flavourful. Well done with the spice and herb play! Very smart to include orange into the salad as it contributed to the juiciness of the meal. Dressing was refreshing with a sweet and a little spiciness. It’s much better than regular mustard! Great choice for those who are not too good with vinegar dressings. As always, almonds go really well with veggie salads. Verdict: A light salad with added proteins. If you just want to go green, you can order just the salad. Included in this salad are one of the healthiest tree nuts — almonds, which are packed with minerals and definitely good for your heart. You’ll also get a serve of vitamin A and C from the tomatoes! If this salad is not your choice, there are two other salads to try – including the Thai Thai salad. What’s in the box: Balls of awesomeness! It’s 100% real chicken breast meat breaded in their special blend of coating. Then, it’s baked to oven crisp perfection. No frying involved. Not even air-frying. Taste: The coating included cayenne chilli pepper, so it tasted slightly spicy. If you need to compare the spiciness, it’s probably at the level of Nando’s mild peri-peri. Crunchy yes, but there’s no oil oozing out like when you munch on fried chicken. Verdict: Great side to order for anyone who’s yearning for a good spicy kick and craving for meat. Sometimes you might want to munch on something more filling and this is a perfect (and healthier) alternative to fried nuggets or french fries. Very addictive. Get them! What’s in the box: The same epic grilled chicken as above, topped with a delicious Greek taztziki sauce made from blending yogurt, cucumbers, vinegar, dill, lemon and garlic. Served with two sides: Irish Colcannon and Garden Salad. Irish Colcannon are actually homemade mashed potatoes with cabbage and leek (none of that icky instant mash). Garden salad was served with mixed coral lettuce, cherries tomatoes and shredded red cabbage in a fresh lemon vinaigrette dressing. Taste: Since it’s the same method used to grill the chicken, the taste was consistent – juicy and flavourful! Mashed potatoes had a good blended texture of soft and some chunks which didn’t make it a boring side (like how some powdered mashed potatoes are). Lettuce from the salad was fresh and crunchy. Verdict: A well balanced meal. Get a good amount of protein and fat from the chicken. Potato was a good choice as a source of carbs since it has more nutrients and fiber compared to plain white rice. Zero fat content from the vegetables – what’s there to dislike? 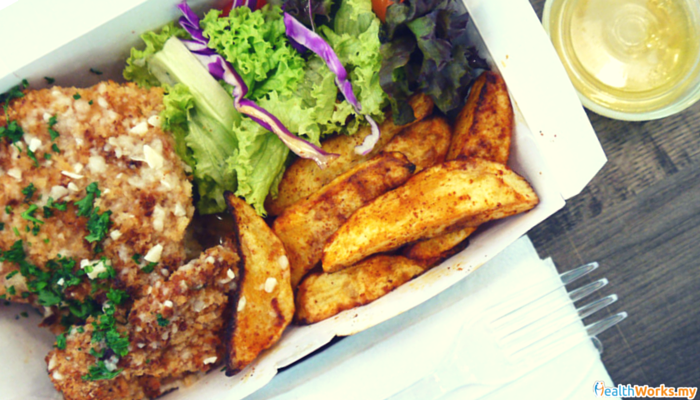 What’s in the box: Dory fillet crusted with a variety of fresh herbs then oven-baked to a crispy, flavourful perfection. Served with special lemon garlic dill sauce, spiced baked wedges and garden salad. Taste: Fish was fresh, fine and tender. First bite was slightly crunchy on top and then when I started to chew on the flesh, it’s juicy, firm and had a light sweet flavour. The crushed bread crumbs as toppings gave the surface a crunchy texture after being baked, minus the extra unhealthy fats from a fried fish. Wedges were mixed with cayenne chilli pepper and because they were served fresh – weren’t soggy. Perfect closure for the dish was when the lemon garlic dill sauce added a twist of refreshing flavour. It went well with the fish, wedges and even the salad. Verdict: This was my favourite meal above all. Coating the fish with breadcrumbs and then baking it is definitely a better idea than deep frying it. Lean dory fish is a good choice as it’s a source for omega-3 fatty acids and protein. The healthy fish oils help reduce the risk of heart diseases too. Served with a side of salad and a dose of fiber-rich potatoes, it was a wholesome meal. Some might think it’s a high-calorie meal. But hey, it’s loower in calories than just one Big Mac (538 kcal), and certainly more nutritious. So, why not? What’s in the box: Marinated chicken breaded in a special blend of herbs and spices which was then oven-baked to golden brown, revealing a crispy “fried” texture. It’s then topped with made-from-scratch Japanese chicken katsu-curry minus the coconut milk. Served with Epic Cauli-Rice and Farmer’s Coleslaw. 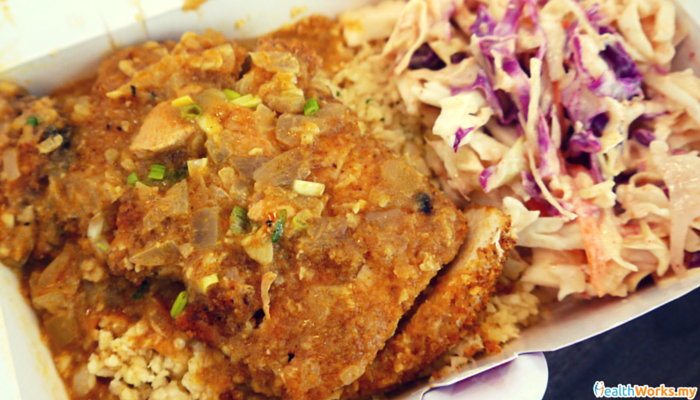 Taste: Similar to the baked crusted fish mentioned earlier, the texture of the “fried” chicken surface served the same crunchy deliciousness. 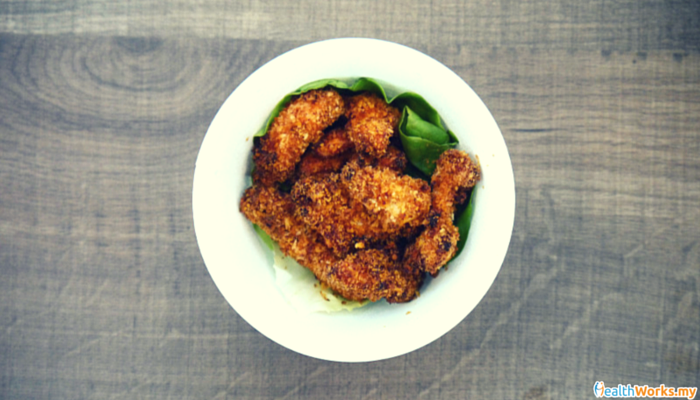 It’s like eating “fried” chicken minus all the guilt, because it indeed wasn’t fried. Chicken breast was cooked to firm, tender and juicy. It’s not easy to have juicy breast meat, so thumbs up for this! Japanese katsu-curry was a lot milder than Indian curry, and is less intense in flavour and much less aromatic. The cauli-rice tasted amazing! I had a bad relationship with cauli-rice because I tasted it raw during my first experience somewhere else. It was bitter. So I was a little apprehensive with this one. To my surprise, I loved it! It was sauteed lightly with chopped garlic. It’s moist, fragrant and could really be a healthier alternative to having rice as a base for your dishes. Coleslaw was okay. Nothing extraordinary and I forgot to ask them to separate the dressing. So if you do order this, remember to request for it. Verdict: I’m not a true fan of spicy food. Unless, the dish is prepared with a good blend of herbs and spices that will be like a marriage of flavours in my mouth. But this didn’t really catch my fancy. 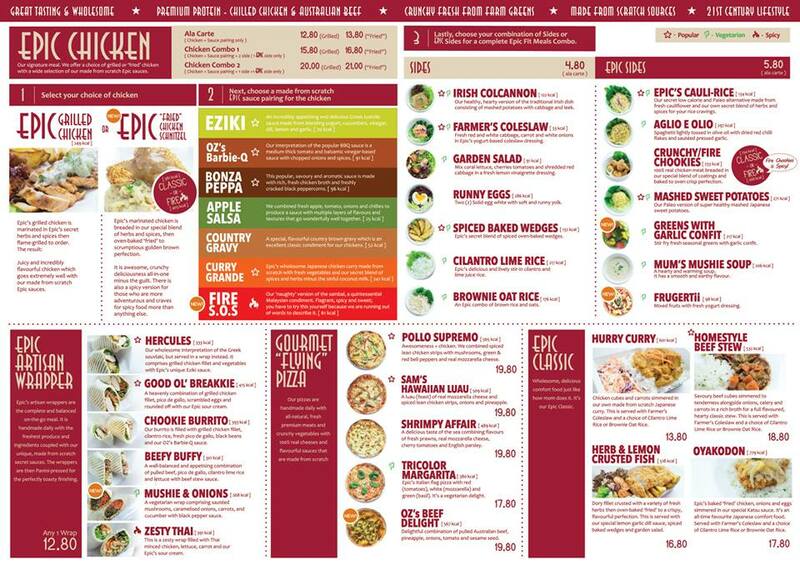 However, I’d definitely order the Epic’s Cauli-rice as a side again! 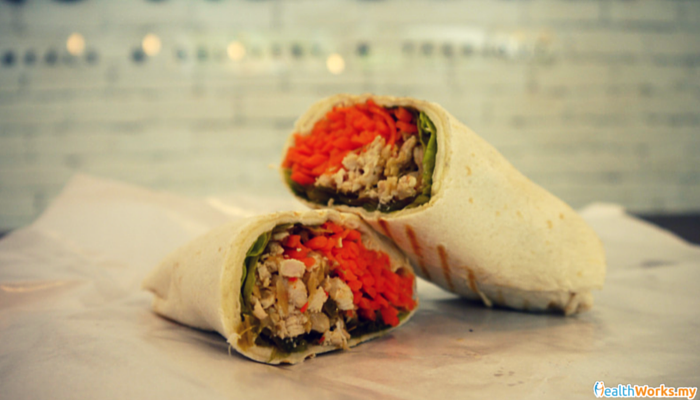 What’s in the wrap: Panini-pressed toasted wraps filled with Thai minced chicken, lettuce, carrot and sour cream. Taste: Slightly spicy with a touch of refreshing lemon grass that gave a good balance to the spiciness. There was a generous amount of chicken breast meat. Vegetables were fresh and you can taste the moisture in them! Verdict: Balanced and complete on-the-go meal for anyone who wants a fast food alternative that will not shorten your lifespan. Do not be too taken aback by sour cream for its high fat and high calorie content. Having them once a while sparingly will not do much harm. Practicality-wise, it’s easy to hold and not messy to eat on-the-go. Some wraps are too bulky. I think they did a good study on customer experience for their wraps. There are a total of 6 wraps to choose from. What’s in the box: Handmade pizza made from scratch. Toppings were lean chicken strips, mushrooms, green and red bell peppers and mozzarella cheese. 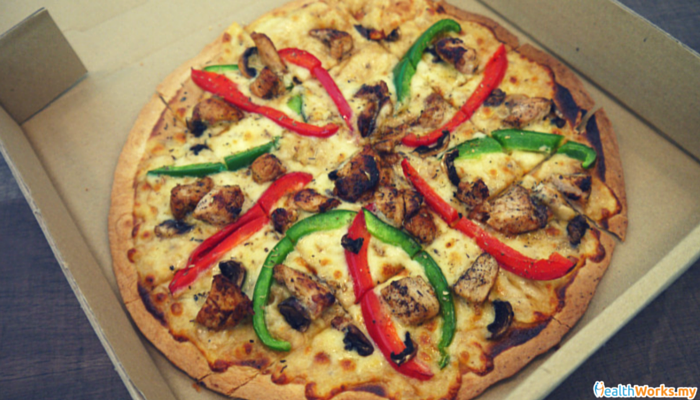 Taste: Thin crust pizzas rule! Crispy, tasty and not overly feeling when shared with others. Though I wished the amount of topping could have been more generous, especially if it’s shared among friends. Verdict: I personally think the pizza could be improved by cutting up the chicken and bell pepper strips into smaller pieces. The bell pepper strips weren’t at a satisfying amount. Maybe cutting them into cubes and distributing them evenly across the top might be better. It’s also harder to chew off a bite when it’s presented as a strip. Smaller diced chicken might make the whole slice of pizza a lot more tastier in a mouthful. Nevertheless, the amount of cheese was decent and chicken breast was well marinated. Blended with apple, fresh yogurt and wild honey. Contains vitamin C and aids in digestion. Taste-wise, this trumps the other two. After all, yogurt and honey in a smoothie will definitely taste yummy. 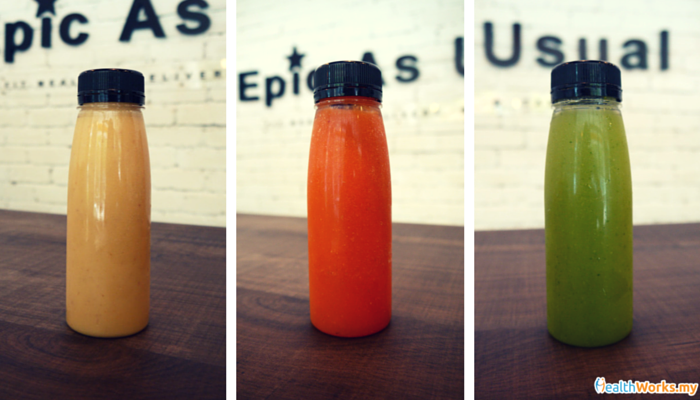 Juice made of carrot, apple and pear. Rich in Vitamin A, C and beta carotene. Power-packed with fiber, the contents of this bottle will definitely be good for digestion. If you don’t like your vegetables, drink your greens then. This beauty is made up of cucumber, apple, ginger, celery and lemon. Great for skin and hair. How did it taste? Well, let’s say it’s a mix of refreshing sweetness and a small spike of bitterness or spiciness (mostly from the ginger and celery). My general opinion was “I’d recommend to try”. It’s wholesome, refreshing, balanced and somewhat creative. If you are within their delivery area, you get the privilege to order as and when you want. How great is that! I returned for a second time after placing an order earlier and get to pick it up as I arrived. Some meals might have a higher calorie count. Epic Fit Meals designed these with fitness geeks in mind as well. So if you are active, you have less to worry about. If you are sedentary, you can always try for a lower calorie meal. Because in the end, it’s far more nutritious than a Roti Canai that has 301 calories. Only fresh, natural ingredients used. A varied menu of well-balanced, flavourful meals. They update their menu once in a while with new dishes. Vegetarian options available. Foods are well marinated, cooked and served. On-demand delivery available to Damansara Perdana, Mutiara Damansara, Taman Tun, Bandar Utama. Guaranteed 30 – 45 minutes delivery. Opens from 11am – 11pm. Last order is 10.30pm. If you would like to pick up, you can. Passionate team with great customer service. One common factor all health food delivery services face: limited coverage. Would be great if they used wholegrain paninis. They can also play more with seeds and nuts. No subscription services for those who’d love to have one. Minimum order of RM20 required for delivery services. So gather your friends and order together! Visit Epic Fit Meal Co and drop them a call/message. 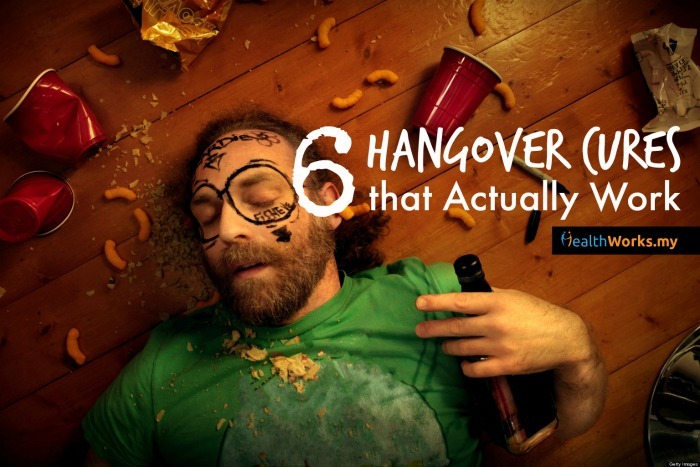 They are usually very responsive. Disclaimer: All meals were sponsored by Epic Fit Meals Co.
View our other food delivery reviews here. 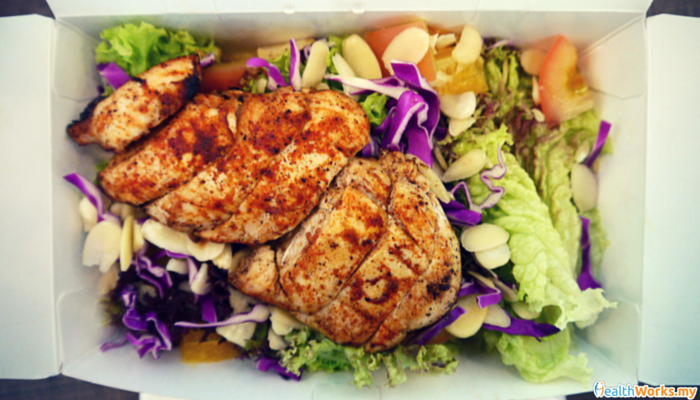 Have a healthy lunch delivery service you’d like us to review? Let us know in the comments below! Paleo Diet: Just a Fad or a Legit Lifestyle?